Home | On this Day in History Quilts series | Midwifery and Quilting. Edna Cable Stanton of Tennessee hand pieced and appliqued this Shooting Star quilt around 1885. 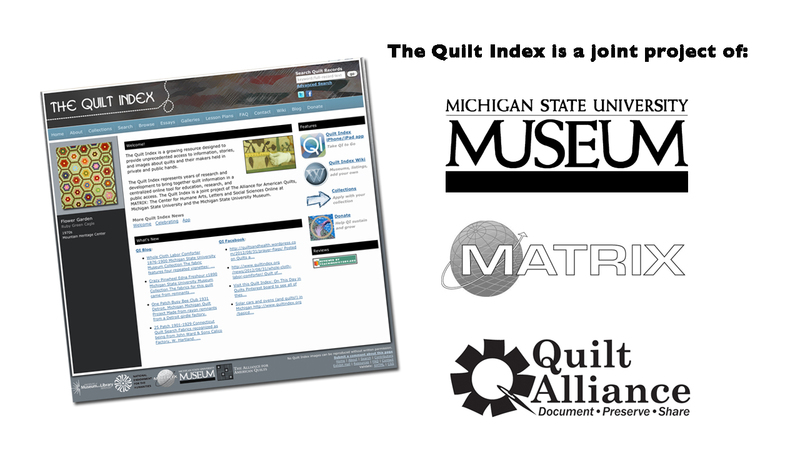 The Quilt Index record states: “Edna Stanton was a midwife and farmer, widowed when her husband died in the Civil War. Anna Stout did the quilting in 1953. She died in 1984 at the age of 96.” A family member documented the quilt during the Quilts of Tennessee project. Thank you so much for adding an enlarged image to the email. The zoom feature does not enlarge nearly as much as you did! I appreciate your hearing my earlier comment about this and acting on it. Bless you! Thanks, Terry! This particular quilt record includes a separate detail image with a pretty high resolution. When such a detail exists for a record I try to include them. Unfortunately, for most records there is only one image uploaded and the quality of the photo and how much it can be enlarged with clarity depends on the photo taken and uploaded by the contributor. So, some images are clear and large enough to zoom in on and others are not. This is a beauty though and so glad we have the large detail. Thanks for noticing and writing! !